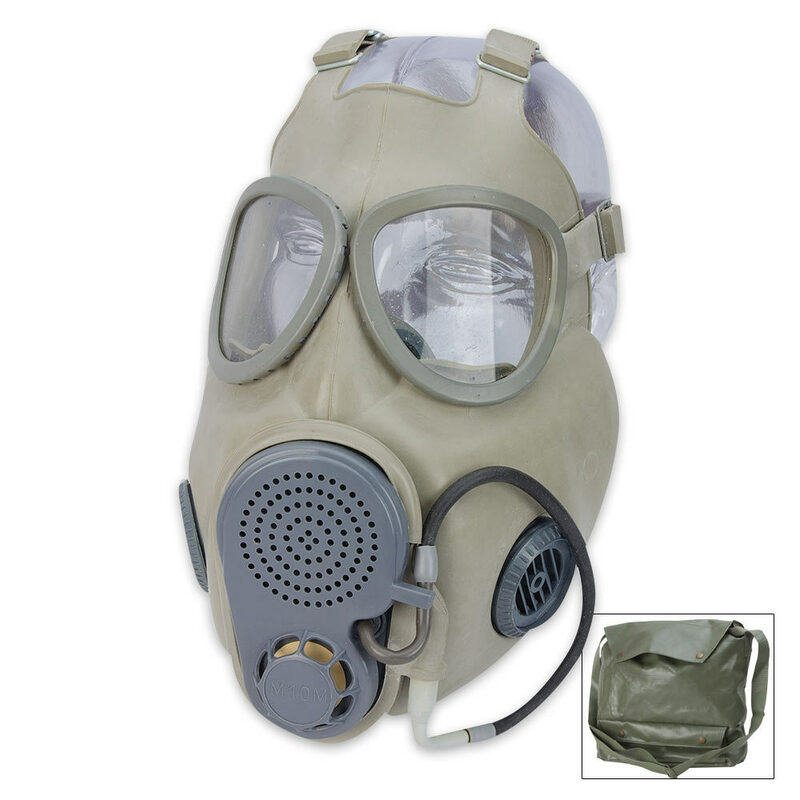 Be prepared for any chemical emergency with this military surplus Czech Gas Mask. The enclosed face mask protects your respiratory system from harmful toxins while the impact-resistant goggles allow you to see. It's perfect for costume parties as well. Includes filter and carrying bag. This is an unissued mask with new filter and drinking tube for hydration during use. This model features a voice box, or speech diaphragm, making it much easier to communicate while wearing the mask. 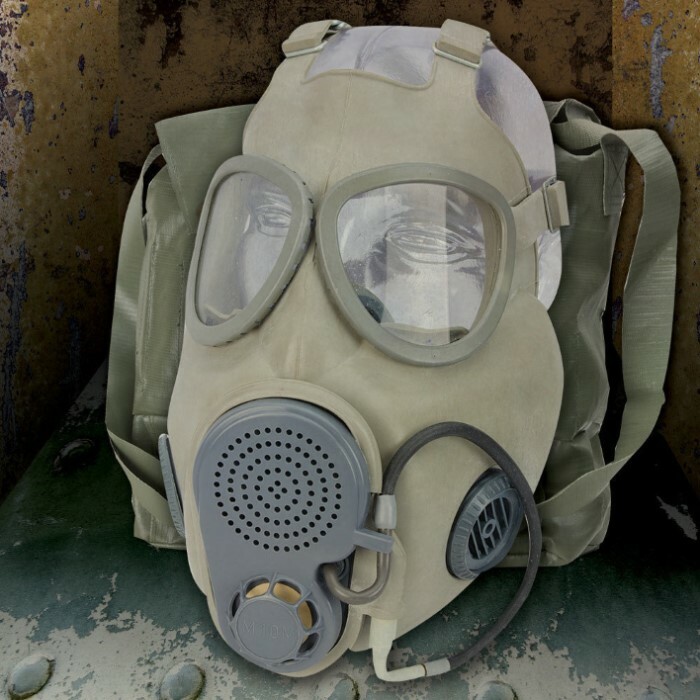 Note: Though these gas masks and filters may function as intended, they have likely exceeded their expiration dates and should be used at your own risk. Well first off it did look new but perhaps it was a return they shipped out again? The 2 filters were out of their packaging and one was screwed to the outside of the mask..... Yeah somebody was stupid. Then the other filter had nowhere to Mount. That part was missing entirely. Called customer service. They said they will replace with a new one. So that's good. But I wish the product had arrived the first time as described. I recently bought one of these and it's a great buy for the price. It works fine just got to know what you are dealing with when putting in the filters.I even purchased spare filters else where for back up.I now own one of these and a German mask along with U.S. mask.I'm pleased with this mask and will be buying more things from here. Came sealed in plastic - mask separate from filters- out of date but didn't matter since sealed. Nice hip/shoulder bag included. Snaps tough but strip of velcro added by me works even better. Going back to my military training - filters tough to fit then as well as now, just got to be careful, work in slowly. Clean . Oder free, most part. Picked up for prepping, but confident will due it's job if only for toxic smoke vapors from chemical spills /fires. By the way, don't use for NBC purposes unless you have complete (level 4) gear. Took me forever to figure out how to install the filters only to find out they expire every year or so. I suggest buying some extra ones because, let's face it, if you don't keep filters installed in them, I can assure you installing them in a hurry is not an option. Couldn't get my wife or daughter to practice with me, either. But as for quality, the masks are really nice. They create a pretty good seal on the face (although now I'm wishing I had gotten one that covers the entire head), and I like the drinking tube option, but I'm going to have to find something else for my daughter because there is a lot of space between her face and the bottom of the mask. There is a BOGO Russian, full head mask I think I'm going to try next. Came with everything described and works perfectly, can't wait to sit back in the apocalypse drinking beers through the tube! One of the coolest buys a made just to get a few laughs i answered the door wearing it and the reactions i get lol. but seriously It is completely functional used mine to when i was cleaning black mold and it did its job. Do not know how old this mask is but rubber is very hard and not pliable. Missing intake valve in mouth piece. Carry bag has button missing on closing flap. Sure hope there is not a need to ever use this mask as it is just worth looking at only. Must me a secret to inserting the filters. Struggled for days, never got the first one in position. Would only recommend this to the enemy. Only gave it one star because it would not accept none.